Morcon is a beef roll made from marinated sliced beef and flattened then stuffed with sliced Chorizo de Bilbao, carrots, bell pepper, sweet pickle, hard boiled egg and sausage. It is then rolled like a jelly roll with all the stuffing inside. The stuffing vary depending on the discretion of the cook who is knowledgeable in making morcon. Then it is browned with some cooking oil on all sides then cooked with the marinade and some water until tender. To make the sauce, in another pan, sauté garlic, onions and tomatoes. Add tomato sauce, bay leaf and broth. Simmer for 20 minutes. Thicken with bread crumbs, season with salt and pepper. Pour sauce over morcon. 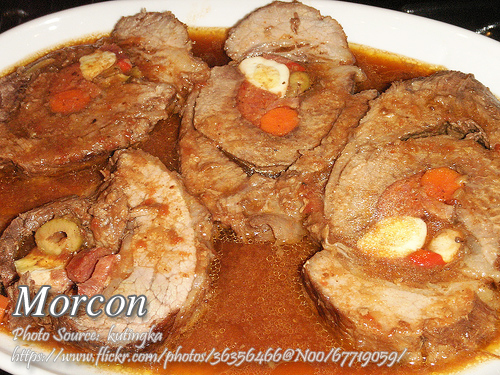 Morcon is cooked most of the time in special occasion in parties or fiestas or even the holiday seasons. Pound beef gently to flatten with a mallet or flat side of a cleaver. Put in a bowl or plastic bag with the marinade. Let stand for 2 hours or overnight. Remove beef from the marinade and lay out in a flat surface. Arrange the ingredients on top and roll up jelly roll fashion. Tie securely with string. In a large pan heat cooking oil and brown meat on all sides. Remove excess oil, add the marinade and enough water to cover the morcon. Simmer over low fire till tender for about 2 hours. When tender remove from broth and cool. Discard string before slicing. In another pan, sauté garlic, onions and tomatoes. Add tomato sauce, bay leaf and broth. Simmer for 20 minutes. Thicken with bread crumbs, season with salt and pepper. Pour sauce over morcon. 8 portions. Nice recipes, can I post this to my blog? Sorry that would be copying.